I think you could do an entire column about magazine subscriptions! Oh, no, Karen! Don’t tell me you’re like me and have subscriptions to magazines you never read. And I fall for it every year. Renewing. I say to myself, this year I’ll make time to read and then, I never do. Oh, well. Guess I’ll keep trying. Woman, I like how you think! I will sign your petition however, I’m pretty sure that the extra day will be wasted since I will use a good majority of it pacing around wringing my hands worrying about how to make the best use of the extra day. Now you see my dilemma. I’m a brand new member of She Writes and found you there. Great blog. Welcome, She Writes newbie! I’m thrilled you found me and my blog. I’m even more thrilled that you’re willing to sign my petition, but I totally understand your hand-wringing dilemma. I myself, facing too many options, have the tendency to cave and do nothing. Oh, well, we’ll just keep trying and hoping we’ll make good use of that extra day, should it ever come! 🙂 I look forward to checking out your blog, too! This is too funny. I suppose I used my hour lambasting the practice of daylight savings time. Oops! ■Clip the dog’s nails so he doesn’t sound like Fred Astaire, tap dancing away every time he walks across the parquet. I love that one!!! I can hear it! Thank you, Kim! For better, for worse, I can hear it, too. I need to teach him how to keep a rhythm as he strides across. That would be so much better, if you ask me. I’m with Bella — I’d LOVE having an extra week. Maybe then I could catch up on everything that needs to be done (especially those doggie toenails — it’s a wonder my poor Sheltie can even walk, not to mention how raggedy he looks all of a sudden!). An extra week would give me time to clear off my desk, finish reading old Writer’s Digest magazines, get farther along on my son’s memory book; hey, and maybe even zap those old photos from my camera and cell phone! Good idea — where do I sign up? An extra 24-hours? Wow. Good one. I think I would bake a cake … A Martha Stewart. Cake ! Hope you post a photo of your Martha Stewart cake. Should be lovely! Bella, I thought of that, too, but didn’t want to appear too greedy. But you’re right, why stop at one day. I would take that extra week but only if I could use it as vacation days, no work. Then I could catch up on everything, plus blog, plus read my blog subscriptions. That would be so awesome. I LOVE that you shared my blog with your S.O. I feel so honored! 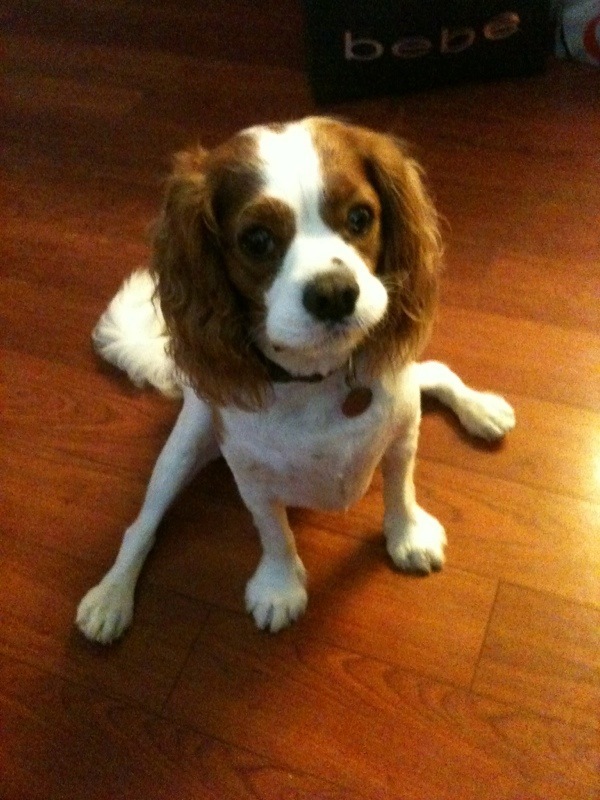 You should see how Henry lays with his legs stretched out as if they’re frog legs. He skips, slides across the floor and his legs land on either side of him. It’s pretty cute! I used to subscribe to about 20 magazines, including Glamour, and finally narrowed it down to 5 and yet I still don’t have time to read them all! Yes, I agree. Having that extra day would be perfect time to indulge in my hobby of scrapbooking. I haven’t done it in a LONG time, not since I started blogging. I’d probably also want to use the time to read up on other blogs, get all caught up. And, of course, there never seems to be enough time to work on my own. Sigh. There goes the day already. Just too much to do, if you ask me. You’re way too industrious, Monica. Know what I’d do with an extra day? Mind you, I’m up by 5:30 am every morning, but I’d spend the extra day in my pyjamas. I’d lay around reading, with a bag of pretzels in reach, a cup of coffee – maybe with Kahlua in it – check my email, maybe do a Sudoku, watch an old movie, eat some ice cream and, basically just hang out. Granted, I’m retired and menopausal, but that doesn’t really account for it. It’s my nature to be lazy and somewhat self-indulgent (ok, a lot self-indulgent) I’m a relic of the 60’s – that’s my excuse. But, yeah, I’d take the extra day. I guess everybody’s got to use it their own way. I love it your way, and frankly, the only way I could probably do that is if I’m doing it away from home. Like when I’m visiting family during the holidays and my to-list is back at home, along with all the errands I need to run. Then, I have no choice and I love the feeling of relaxing and watching old movies all day long. Now, that’s sweet. Fun post, Monica! All good reminders that there are things to do, besides grab that extra hour of sleep. Okay, I’ll quit slacking and send a care package to my daughter and then I’ll tackle the other 15! Oh, no. Slacking is what the extra day should be for. For me, it would definitely be a do-nothing day. But then again, I get a real sense of accomplishment from that. Nothingness is not as easy to achieve as you might think. Great idea! I used to love the extra hour until I had a child who doesn’t get the blessing of an extra hour. Her body woke up at the same time — didn’t matter what the clock said! Leah, you must find a way to convince her it’s for her own good to sleep away that extra hour. It’s so worth it! Of course, I have the same dilemma with my dog, Henry. Sigh. WOW! It is mind-boggling that it is already time to start the spending. Where’s the moola? I did enjoy this post. Now I know I’m not the only one with that nagging list of chores and phone calls and appointments to make, hanging over my head! Sign me up on the extra day petition. I woke up this morning thinking it was so luxurious to lounge in bed for an extra hour on a cool, rainy morning, so that’s precisely what I did. I rarely sleep in so I really treasure this one day a year when I have guilt-free permission to do so. Imagine my shock when I strolled downstairs to read the newspaper, and the microwave clock said it was only 6am! I have an entire day ahead of me to play basketball, read the New York Times book review, watch football with my husband, finish a good book that I’ve been reading, all the while knowing that I could accomplish all this AFTER having slept in. Oh yes, sign me up for that extra day! Yes! Score! Finally, someone willing to sign my petition. All we need are another 50,000 and maybe we’ll have enough to put it on next year’s ballot. That extra day will be here before you know it! I prefer falling back so much more than springing forward. And somehow I find that the extra hour does last all day long. I keep looking at the clock and thinking it should be an hour later than it actually is. Now that’s fun. Too bad the feeling can’t last all year long. In any case, I hope the extra hour helped you do some serious NaNoWriMo writing! I can think if a million things to do with that extra day or just the extra 15 minutes. Real Simple magazine did a chart showing how long it took to perform regular daily chores. When I realized how quickly I could perform them I started getting more done. With an extra 24 I think I would just relax and recharge. Like winning the “time” lottery. Fun to think about!!! I would love to relax and recharge but, unfortunately, I know myself too well, and would never succumb to such relaxation. Not when I have a list of stuff to do that I keep putting off. Yikes. I love the idea of falling back an entire day! How about falling back into bed? Falling back into a field of dreams? Speaking of which, a quick check of the clock tells me the real time is 5:43AM PST. Zzzzzz . . . Yes, and why did you get up so early today. Didn’t you warn your system of the change. Or is it a case of daylight savings jet lag? Hmm…. One more day? I’d definitely hire that organizer to start bringing some order to the chaos that is my home filing system (what system, you may rightly ask?). And if you have one more hour in your week this week, Monica, definitely use it to pick up the phone and make every overdue doctor appointment you need to make. Nothing’s more valuable than your health. Yes, I will. I have to stop using every excuse in the book to avoid it. Here’s my chance to do the right thing and schedule that appointment. Thanks!